A total of 306 sherds (3.2kg) of pottery was recovered, the majority (89%) dating to the medieval period. The remaining 34 sherds (721g) are of post-medieval/modern date and were primarily found in topsoil/subsoil deposits. These are principally glazed earthenwares of south Somerset type, broadly dateable across the late 16th to 18th centuries, with the remainder comprising whitewares and stoneware dating to the 18th and 19th centuries (Table 1). The medieval group totals 272 sherds, weighing 2479g, amounting to 1.15 rim EVEs (estimated vessel equivalents). Almost all derived from Area 2, with much of the material recovered from the medieval building. On the whole the assemblage is consistent with what would be expected for a medieval pottery assemblage from the area. The bulk of the unglazed coarsewares are of Upper Greensand-derived group (UGDG) type, equivalent to Exeter fabric 20 (Allan 1984), and were manufactured across the Blackdown Hills of East Devon/Somerset (Allan and Langman 2002). 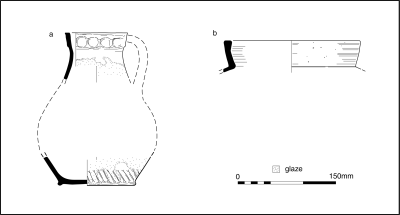 The identifiable vessel forms in this type are all jars with rims (simple everted, everted with expanded top, and 'cupped'), matching those of vessels from Exeter (Allan 1984, 4, fig. 3). As is typical in the region, there is variance in the visible composition of this ware type, although it is consistent in containing 'polished' coarse quartz grains and chert/flint inclusions. A variant, elsewhere described as Membury-type ware (Allan and Langman 2002, 61-62) and distinguished by voids in the fabric deriving from leached calcareous inclusions, is present only in small quantities. Unglazed coarsewares in finer sandy fabrics are more difficult to classify and source. The fabrics are unlike the pale-firing fabrics known from the region and manufactured in the Poole harbour area. They compare more closely with Exeter fabrics 24 and 26 (Allan 1984, 5). An illustrated vessel (Figure 9b) is notable for its wheel-finished rim, a feature of some late medieval vessels from Exeter (Allan 1984, 89-90, nos 1457, 1510). South Somerset glazed ware was recorded from four deposits, although sherds from deposits 27027 and 27084 represent a single, well-fragmented vessel (Figure 9a). The form of this vessel, a globular jug with a thumbed strip applied below its rim, is comparable with examples known from Exeter (Allan 1984, 65, fig. 28, nos 818–19). The Exeter vessels date to the 15th or 16th centuries, although similar thumbed decoration is a feature of later medieval jugs elsewhere, including among Bristol-type glazed wares (Ponsford 1998) and Donyatt vessels (Gutiérrez 2007, 612). The form of the vessel and absence of other decoration corresponds with a 14th-century date. The remainder of the glazed fabrics consist of oxidised-firing (buff or pale-orange), fine, sandy types, thought to be manufactured in or close to Exeter (Allan 1984, fabrics 40 and 42). Large sherds are scarce, preventing the fullest identification of vessel forms, but most sherds represent jugs. A jug base from the internal stone wall 2011 features a thumbed base angle, and some sherds exhibit plain applied strips, white 'painted' strips or white slip/coppery glaze. A sherd with internal glaze from deposit 27027 probably comes from an open vessel form, as described by Allan (1984, 5, fig. 4, nos 4–5). There is little clear evidence for differential chronology across the site, although small context groups of medieval pottery rarely lend themselves to close dating. Nevertheless, activity appears to have been relatively short-lived: the presence of Exeter-type and South Somerset glazed wares, both of which occur in Exeter from c. 1250, implies a date after this time. The occurrence in most deposits of UGDG-type coarsewares suggests that the assemblage dates to no later than c. 1350/1400. It is probably significant that the deposit containing the South Somerset jug (Figure 9a) and wheel-finished coarseware jar (Figure 9b) was at the end of the stratigraphic sequence, overlying the building. Both are forms suggestive of a late medieval date, probably after 1300.